Rapid growth in Arizona has created a host of new opportunities for the Arizona State Land Department (ASLD) to participate in the development of land for residential, commercial, and other uses. The ASLD secures its highest levels of revenues from state trust land dispositions, typically for commercial or residential real estate development. In fiscal year 2015, ASLD revenues from the sale of state trust lands totaled over $135 million, making the lion’s share of the total ASLD receipts for 2015 of $203 million. 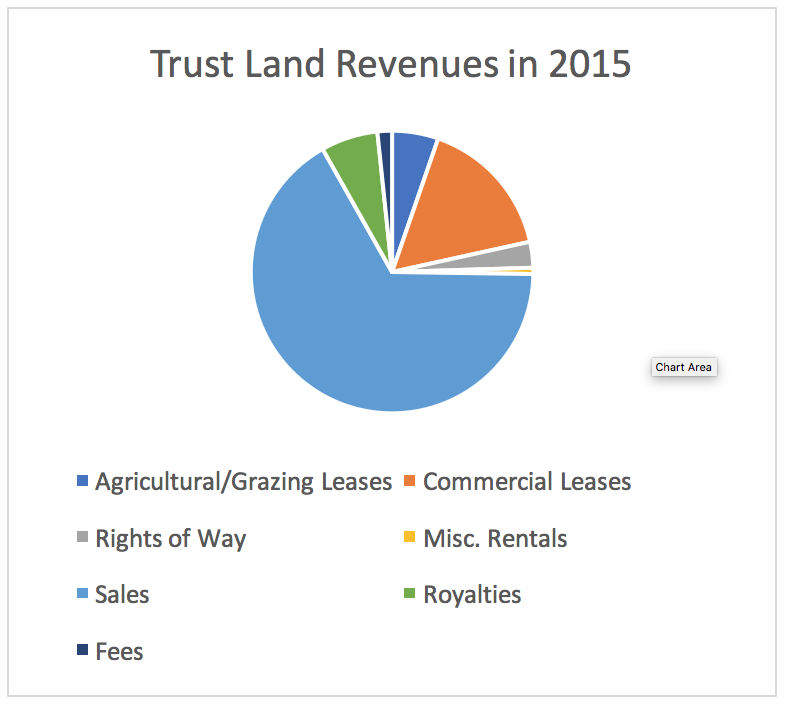 While state trust land sales are the most significant source of revenues for the trust beneficiaries, they comprise a tiny fraction of the total state trust land portfolio. In 2015, the revenue generated through sales was secured through the disposition of only four parcels, all of which were in Maricopa County (three in Scottsdale, and one near Lake Pleasant). Even during the go-go years for real estate development in Arizona in the mid-2000’s (2004-2007), the ASLD sold on average between 2,000 and 3,000 acres of state trust land – primarily in the major metropolitan areas of Phoenix and Tucson. In recent post-recession years, the total acres of state trust lands sold for development has decreased dramatically. 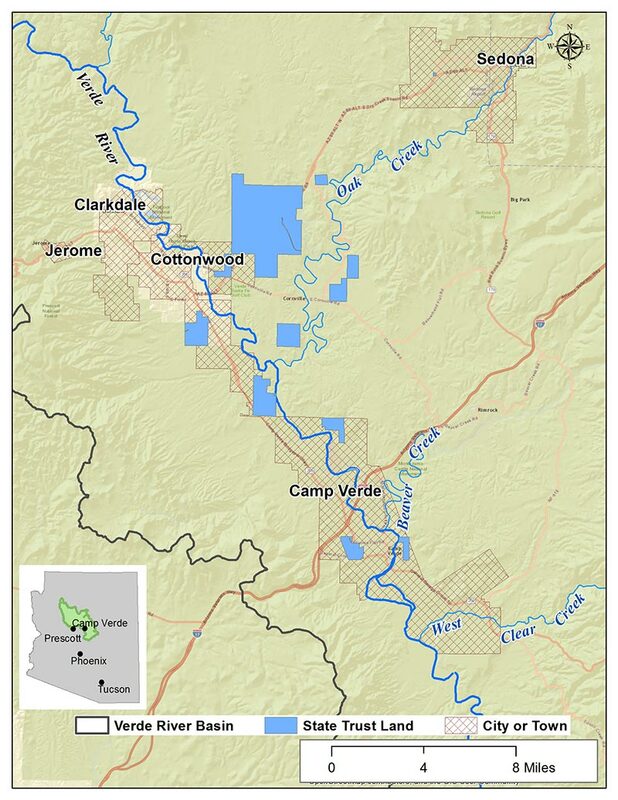 In fact, there were a couple of years during the recession when the only sales of trust lands in Arizona were made through the Arizona Preserve Initiative process; those lands were purchased by local governments as conservation and open space lands. The factors that contribute to the limited amount of state trust lands that can be sold for development or other purposes include real estate market cycles and absorption rates, where there are simply not enough interested buyers to support the sale of more than a few thousand acres per year, as well as capacity constraints within the ASLD itself to plan and bring trust land parcels to auction. Arizona is also subject to some of the strictest trust requirements governing the sale of state trust lands. These factors have the overall impact of requiring the ASLD to focus their land use planning and disposition efforts on a relatively small number of parcels that have the potential to bring in the greatest sales revenues. The process of prioritizing which lands should be sold in order to recover the greatest gains for the beneficiaries can present an opportunity to work with the ASLD to also identify lands that are more valuable for long-term retention, such as those providing critical watershed services. For those lands that do get prioritized for sale by the ASLD, there may also be opportunities for watershed protection as part of the conceptual planning process by ASLD, the master planning process by the purchaser, local zoning processes, and through promotion of development styles that reduce consumptive use or minimize the impacts to watershed function. Sales of state trust lands are governed by restrictions in the Arizona-New Mexico Enabling Act as well as the Arizona State Constitution, which require that trust lands be sold for “highest and best use” at a publicly announced auction for fair market value. Since 1912, the ASLD sold, exchanged, or otherwise disposed of over 1 million acres of state trust lands. For much of the early history of the ASLD, the sale of trust lands happened in a somewhat reactive pattern driven largely by a developer or other purchaser’s interest in the parcel. The resulting mode of responding to buyers meant that trust land sales were not always strategic in serving the best interests of the beneficiaries or gaining the best price per acre. However, in 1981, the state legislature passed the Urban Lands Act and later, in 1998, the Growing Smarter statute; both provided guidelines for a more proactive, defensible, and rigorous planning process prior to the disposition of state trust lands. Growing Smarter introduced a framework for the “conceptual planning” process for the ASLD, where the Department, in conjunction with local jurisdictions where trust land parcels are located, identifies urban state trust lands that are appropriate for incorporation into local government’s general and comprehensive plans. From this process, a 5-year disposition plan for state trust lands is prepared to identify trust lands that will be master-planned, zoned, and sold during the five-year time period. The consideration of the natural values of the trust lands in question, including floodplains, wildlife habitat, geology, historic and archaeological resources. And, consideration of the impacts related to the timing of development, impact on existing leases and resources available to the ASLD for planning activities for the parcel. Additionally, the State Land Commissioner is also required to consider market demand, transportation infrastructure, and the availability of development infrastructure prior to the inclusion of any state trust land parcel in the 5-year disposition plan. Over the past decade, the ASLD has developed a detailed ranking system of the state trust lands in their portfolio to meet these planning requirements. The system is a GIS-based tool that compiles information about land valuation, available infrastructure, and the physical attributes of the parcel, which are used to evaluate the relative development suitability of state trust lands. Through this tool, trust land parcels are ranked, and the highest suitability trust lands are evaluated further based on market analyses and other criteria. The process has enabled the ASLD to optimize revenue generation by focusing their limited staffing and resource capacity for disposition planning on those lands that have the highest market value for sales and that are likely to be most easily developed. Thus, while the total amount of trust lands sold have remained steady at only a few thousand acres per year, the ASLD has been able to make record-breaking sales by targeting the most valuable lands.